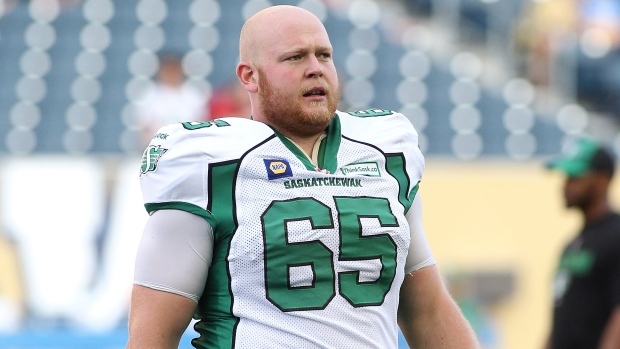 Former Saskatchewan Roughriders offensive lineman Ben Heenan has agreed to terms with the NFL's Indianapolis Colts, according to TSN's Farhan Lalji. "Colts fans! It's time to welcome CFL guard Ben Heenan to #ColtsNation!" the team tweeted. The Regina native was released by the Roughriders on Monday so he could pursue opportunities south of the border. Heenan entertained offers from five NFL clubs. This is the second former CFLer the Colts have come to terms with this off-season, earlier signing Duron Carter who spent the past two seasons with the Montreal Alouettes. Another former Roughrider, Jerrell Freeman, and former Winnipeg Blue Bombers linebacker Henoc Muamba are also currently on the team. Heenan, 24, was drafted first overall in 2012 and spent three years with the Roughriders, winning a Grey Cup in 2013.